Anna Sparks has been working as a personal coach for over six years. Anna is remarkably qualified for a science-based approach to coaching and has an undeniable genuine desire to help athletes realize their full potential. Anna’s impressive athletic resume began with the Ole Miss Rebels Soccer Team at the University of Mississippi where she also received a B.S. degree in Exercise Science and Master’s degree in Exercise Physiology. She began dabbling in cycling and triathlon in 2004 after her collegiate soccer career. She realized her talent on the bike and transitioned to competitive cycling in 2009 and and went on to race in the women’s professional peloton for six years. After her professional career, Anna still rides with friends, and has aspirations to become a professional hiker. Anna was a graduate assistant strength and conditioning coach for the Ole Miss Rebels athletic department while completing her master’s degree. During this time, Anna also completed an internship in strength and conditioning at Auburn University working with Olympic swimmers. After completing her master’s degree she became the assistant soccer coach at The University of Arkansas and spent four years coaching the Lady Razorback Soccer Team. She moved to Phoenix, AZ in 2008 to join the Arizona State Sun Devils as the assistant soccer coach and also worked for 4 years as a personal coach for Sigma Coaching before starting Sparks Systems in 2015. 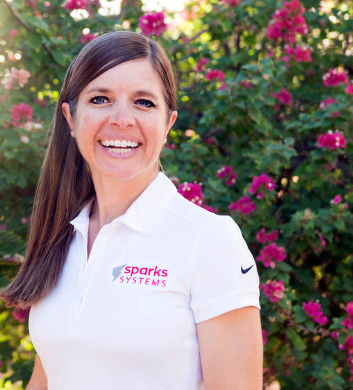 As the CEO and Founder of Sparks Systems, Anna trains all of the Sparks Systems’ metabolic coaches and oversees the functions of the entire organization. As both the “brains” and “heart” of Sparks Systems, she inspires people to become the best version of themselves — both as metabolically efficient human beings and as persons of integrity. Sparks Systems utilizes running, cycling, and/or resting metabolic testing to pinpoint inefficiencies in both training and nutrition. Addressing these inefficiencies enables maximum return on investment. The results from a client’s Sparks Systems metabolic test serve dual purposes: (1). To help our coaches determine heart rate training zones to increase overall aerobic fitness, and (2). To help our registered dietitian accurately modify daily nutrition to address any/all inefficiencies. After performing a metabolic test, clients will be provided with individual heart rate zones, which removes the guesswork out of training and the ability to increase your overall aerobic fitness. Your results will also be used to determine where inefficiencies lie from a metabolic standpoint, so overall health can be addressed through modifications in nutrition and adjusting the intensity of training. Sparks Systems’ scientific approach to nutrition and training will empower you to achieve your fitness and wellness goals. By utilizing metabolic testing to pinpoint your exact nutritional and exercise needs, we will help you will achieve your healthiest self. Sparks Nutrition, is provided by a Registered Dietician Metabolic Efficiency Training Specialist™to guide clients towards health, wellness and fitness by modifying daily and sports nutrition to promote metabolic efficiency. Metabolic efficiency is a key component to optimizing blood sugar and insulin levels, burning more body fat and having a leaner body, decreasing body inflammation, boosting your body’s ability to heal and recover, increasing overall energy and strength, decreasing injury and risk of chronic disease, and improving athletic performance.